Stephanie Edgley’s uncle, Gordon, has passed away. But inheriting most of her uncle’s estate was not the strangest thing that happened to her at the will reading; she met Skulduggery Pleasant, a skeleton who is an investigator friend of her uncle. And then there is strange revelation after strange revelation, but Stephanie is a gutsy fighter who wants in on the action, no matter how much that involves magic and injury. This is far too much awesome fun. There’s action, intrigue, humour (a lot of humour) and magic! I would recommend this to someone who has read Harry Potter and gets the magic thing, though it’s not as earnest and keen as that series. It is, however, an excellent step toward Terry Pratchett and Douglas Adams. 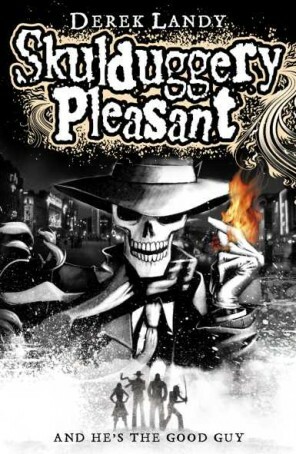 There are heaps more Skulduggery Pleasant books, if you are looking for a series to keep you on the edge of your seat, this could be it. Not sure about this series. although I do love Pratchett and Douglas Adams…but a bit of magic never goes amiss. There are a lot of similarities between this and the work of both Pratchett and Adams, though I think I love them more. But this has some top characters and, three books in, I want to read more!